The Stakeholder's Chartbook: The Dollar: A Canary In The Coalmine? 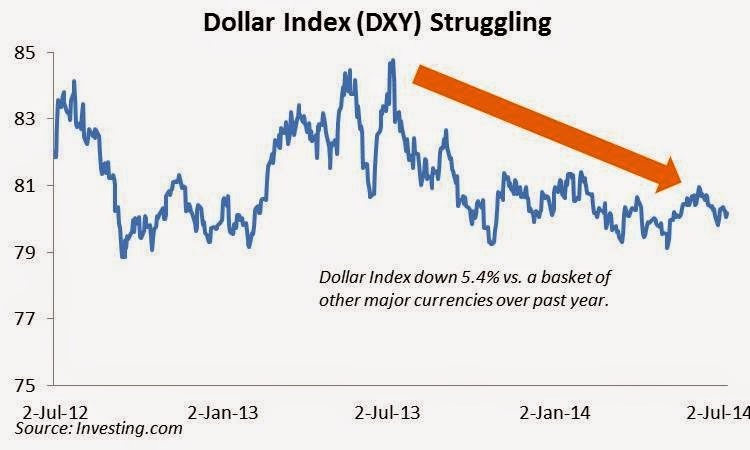 The Dollar: A Canary In The Coalmine? For much of the current year, the eyes of many in the investment community have been focused upon the continued dubious rally in U.S. equities, which after stumbling out of the gate have gained 13% since early February. At the same time, the yield on the 10-Year Treasury has not broken much above 2.5%, despite purportedly improving economic data, namely on the jobs front, as well as the Fed’s announcement that the latest iteration of its bond-buying will be wound down by autumn. Overshadowed by these developments has been a steady weakening of the dollar. 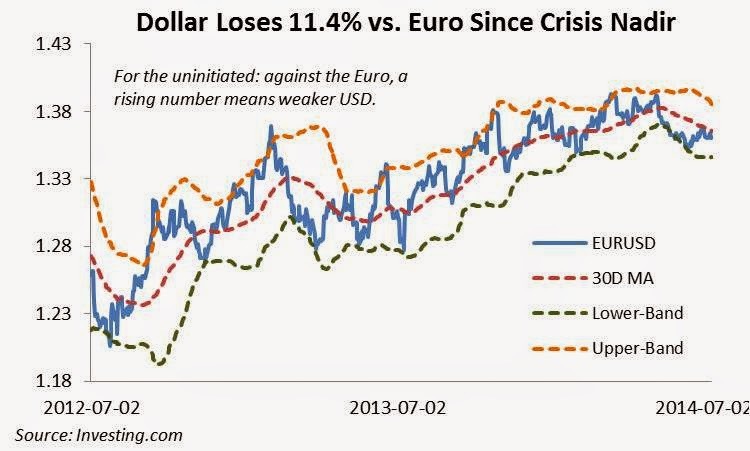 Over the past two years, the greenback has lost 11.4% of its value against the Euro. And that’s against a currency that many thought might not be around….at least in its present form….today. Granted there may have been a sympathy bounce since the nadir of the Eurozone debt crisis, but at what cost? Growth throughout the currency bloc’s periphery continues to be strangled by austerity, and in the name of doing whatever it takes to exit the crisis, even the Germans have agreed to green-lighting Europe’s own version of quantitative easing should it come to that, shadows of the Weimar Republic be damned. But it’s not just against the Euro. The broader dollar index (DXY), a basket comprised of six major currencies….albeit weighted towards the Euro…., has slipped 5.4% over the past year. Two years ago, when the dollar was, relatively speaking, riding high, this forum championed a strong dollar policy and the benefits it would bring to an advanced economy such as the United States as well as to its financial markets. Evidently no one was listening. Why would a forum geared mainly towards mainstream investments venture into an esoteric asset class such as foreign exchange? Three simple reasons: the dollar’s level and outlook impacts virtually every other asset class, the same policy distortions that are arguably driving risky assets higher are also sending the greenback lower, and lastly…and even more sinister than the previous point….perhaps the day is drawing nearer that the chronically weak U.S. fiscal position becomes too egregious for markets to ignore, manifesting itself in an enfeebled currency and all the economic headaches that accompany it. The foreign exchange market is massive. How massive? The Bank of International Settlements puts the tally at north of $5 trillion per day, making it the world’s largest financial market. Theoretically…a loaded word in economics….the relative value of a nation’s currency reflects the demand for the nation’s products and services (and thus the local FX to pay providers), the overall growth prospects of the country, its fiscal position, namely its ability to pay its public debt and lastly its monetary policy, ideally administered by an independent central bank not coopted by politics. 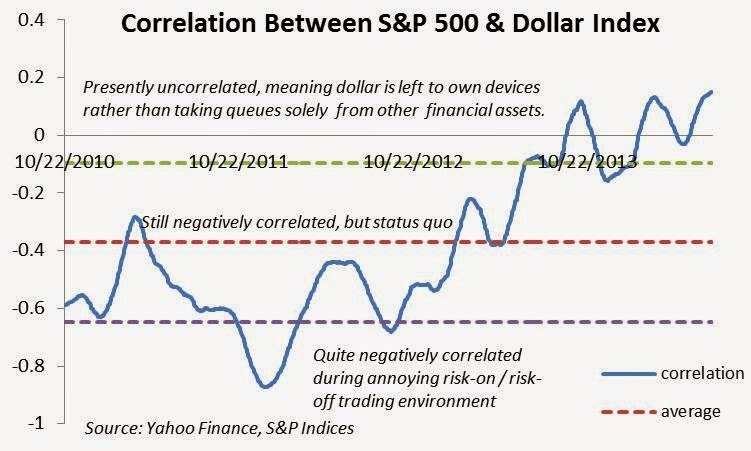 In reality, the FX market is unlike other broadly traded assets in the fact that the markets are blatantly distorted. Rather than having supply and demand drive price and let the chips fall where they may, currencies are manipulated by policies ranging printing money, which weakens it, buying up excess local currency with foreign reserves to prop it up in shaky times, and the setting of benchmark interest rates to levels which directly impact demand for instruments denominated in a currency. One need not venture far past page two in a financial newspaper to find contemporary examples of each of these phenomena. In Vegas parlance, if you are a currency trader, you are playing against a dealer with a loaded deck. The dollar occupies a special position in currency markets as it is the dominant unit used in settling international commercial transactions as well as being the de-facto reserve currency for the rest of the world. These result in built-in demand for dollars, which largely has given the country a get-out-of-jail free card for decades when it comes to glaring fiscal imbalances. Given its position as a reserve currency, along with dollar-denominated Treasuries being the global standard for risk-free assets, the greenback performs well in times of economic uncertainty, paradoxically even when the source of said uncertainty is the United States (see the 2008 housing crisis). Normally such domestic tumult would send investors fleeing from the transgressor’s currency. The economist Stephen Jen, formerly of Morgan Stanley coined this concept the dollar smile. When the world is seemingly on fire and flight to safety paramount, the dollar rises. That is one side of the smile. 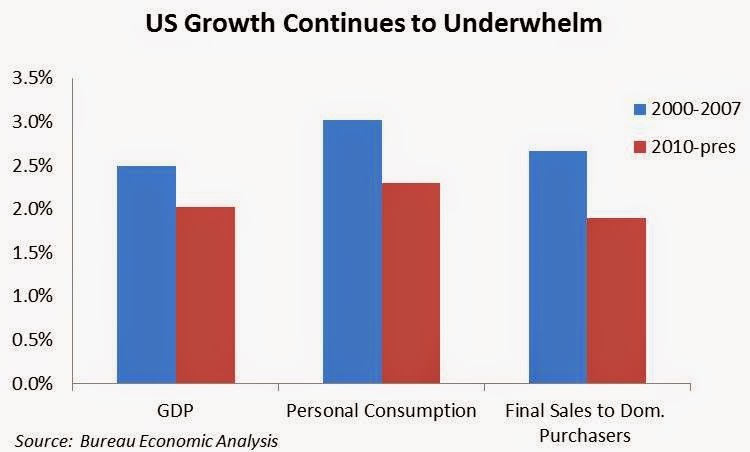 If America’s economy is performing well, relative to other global players, the higher growth rates….accompanied by expectations of increasing interest rates….push the dollar up as well. That’s the other side. In the middle, the dollar tends to underperform when all the world is rosy and investors can pick off extra yield in currencies that tend to have higher interest rates than the U.S. (think emerging markets). This is what makes the dollar’s current slide so vexing. While not exactly in flames, prospect beyond U.S. shores are hardly impressive. Japan has emptied its economic quiver in hopes of ending two decades of malaise, with nearly all of its monetary and fiscal arrows being Yen negative. The Eurozone at age 15 is going through an adolescent identity crisis, unsure of what it wants to be when it grows up. And many emerging markets have fallen back into old vices including state control (Russia), politicians brow-beating central bankers (Turkey) and an inability to tame inflation through sound policy (nearly anywhere in Latin America). By comparison China looks lovely. But there growth is not what it once was, it has a property bubble to deal with, and the state’s tentacles continue to firmly grip the levers in key industries (e.g. banking), clouding commercial decisions. Back in the U.S., after a shaky start to 2014….far too conveniently blamed on lousy weather… economic data have improved of late, namely on the jobs front. Skipping the population survey’s headline unemployment rate (currently 6.1%), which is littered with so many arbitrary omissions to render it meaningless, meatier data from the establishment survey have indeed been strengthening. 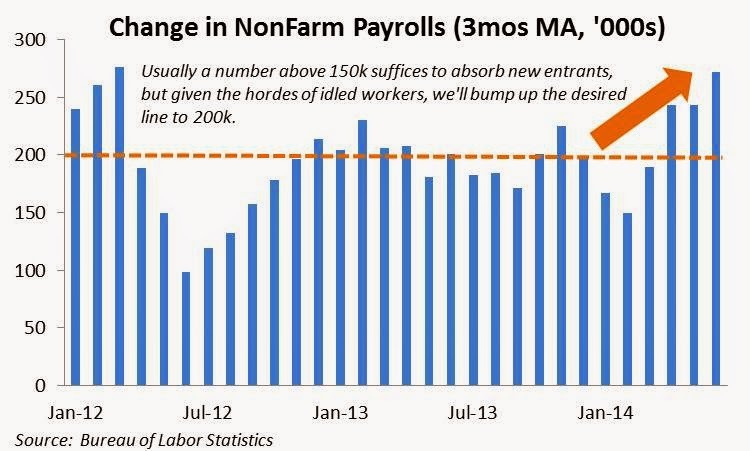 As seen below, the change in nonfarm payrolls has been on a tear with the three-month moving average registering well above 200 thousand in each of the past three months. This amount is sufficient to absorb new entrants into the workforce as well as the legions that continue to remain marginalized…those not counted in the population survey….five years after the recession’s end. The combination of rough seas globally and steady….if not spectacular…improvement at home…should infer that investing in U.S. assets is the only game in town. Looking at the S&P 500, Treasuries and pockets of red-hot real estate prices, this appears to be the case. But the dollar lags. Rather than benefiting from the aforementioned dollar-smile, the trajectory of both the greenback and U.S. stocks can be explained by another phenomenon: recent moves are likely the result of extraordinary monetary policy. 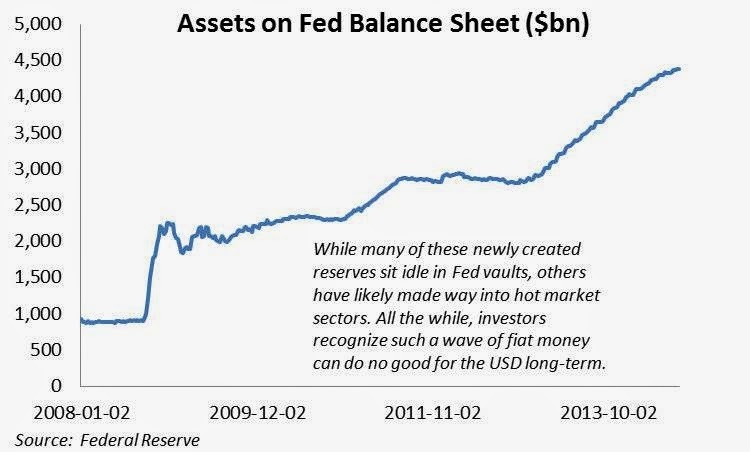 The Fed’s dominant role in absorbing less-risky bonds, which has sent investors scrambling for yield in stocks and dodgier loans, has been paid for with the dollar-negative expansion of the Fed’s balance sheet (upwards of $4 trillion at last count) via the printing press. Exacerbating the problem is the fact that the Fed’s indirect assault on the dollar could not have come at a more inopportune time. For years economists have prophesized doom for the U.S. currency (and the economy) should the country not get its fiscal house in order. 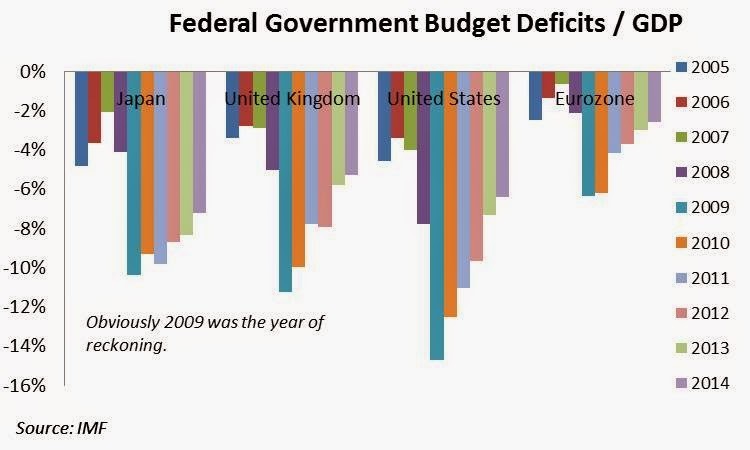 Yet the supposed benefit of quantitative easing….a return to robust growth…has failed to materialize, and without a boost to government revenues at the same time ever greater pressure is placed upon safety-net outlays, the country’s fiscal position has only worsened. As seen below, the federal government’s deficit is projected to remain above 6% this year. Granted the Fed is stacking the deck in the Treasury department’s favor with artificially low rates, but deficits at this level mean that interest obligations continue to add to the federal debt, which remains over 100% of GDP. 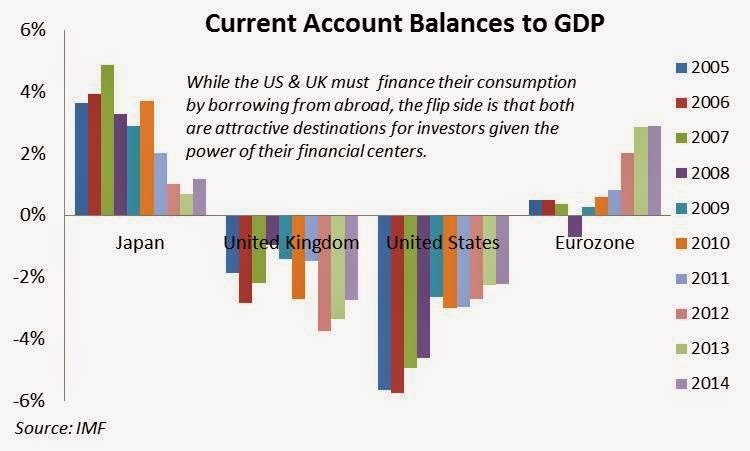 Paying this down is complicated by the fact that the U.S. is not a nation of savers, as evidenced by chronically negative current accounts balances. The dollar’s position as the world’s reserve currency has enabled the country to get away with such imbalances, but at some point in the future, the willingness of foreign investors to continue providing credit to such profligate spenders may diminish. The risk is that far-off day may be drawing nearer. Those who don’t study history are doomed to what? A stated goal of Fed policy is to drive up inflation expectations in order to cajole consumers to spend before prices increase even more. The merits of such a tactic is questionable being that excess consumption, along with its housing investment cousin, led to the imbalances and credit overloads that drove the economy into deep recession. As we have argued in the past, an economy dominated by personal consumption and housing at the expense of business investment and exports is not equipped to deliver consistent long-term growth. 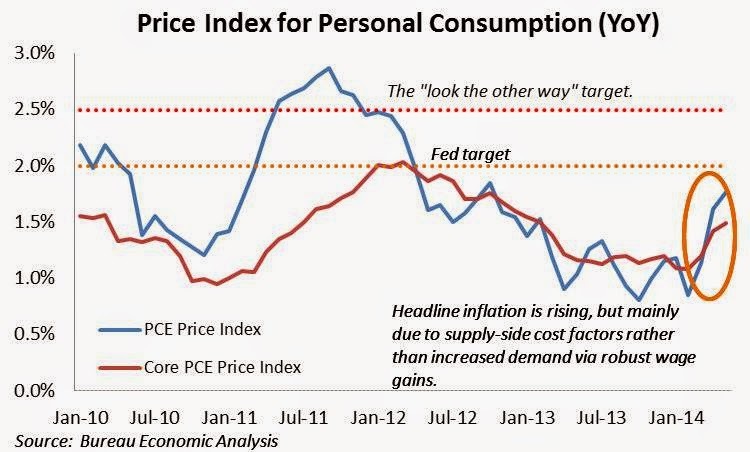 It is true that headline inflation, as measured by the Fed’s favored gauge has ticked up over recent months, but much of this is attributable to one-off factors, that when stripped away, results in a more subdued 1.5% year on year core inflation rate, well below the Fed’s target of 2% or wink-and-nod limit of 2.5%. 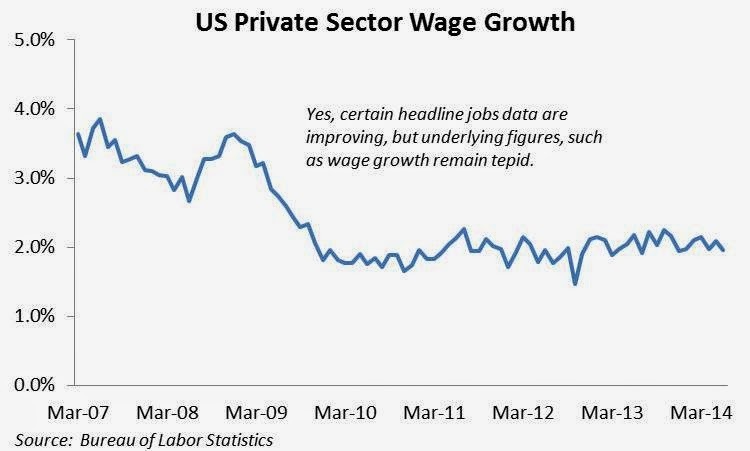 The truth is that in an advanced economy dominated by the service industry, a key driver of inflation is wage growth. 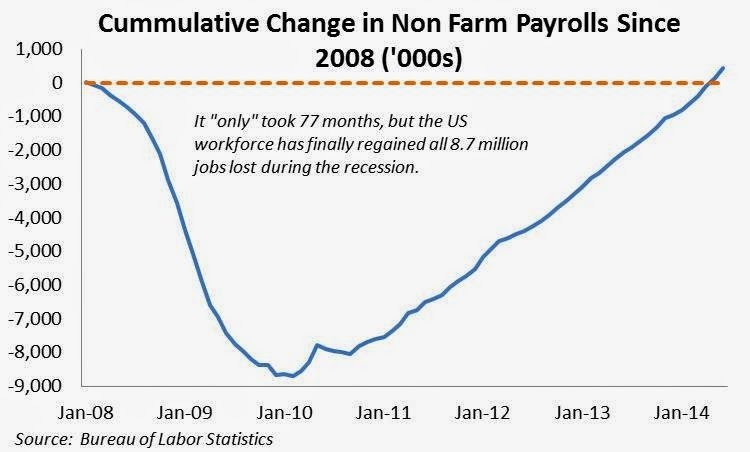 Unfortunately….and despite the improving nonfarm payrolls data….wages gains have been miserable, averaging 2% annually since mid-2008 versus 3.3% in the lead up to the crisis. And What of a Strong Dollar? Rather than seeking to ignite inflation, which also debases one’s currency, authorities could have taken the strong-dollar route. The U.S. is already a top investment destination both in the form of portfolio investment (financial markets) and stickier foreign direct investment, or FDI. A large economy, strong legal framework, transparency and liquidity all contribute to this. With the country in dire need of a catalyst to emerge from its 2% growth funk, an injection of foreign capital would be a welcome development. 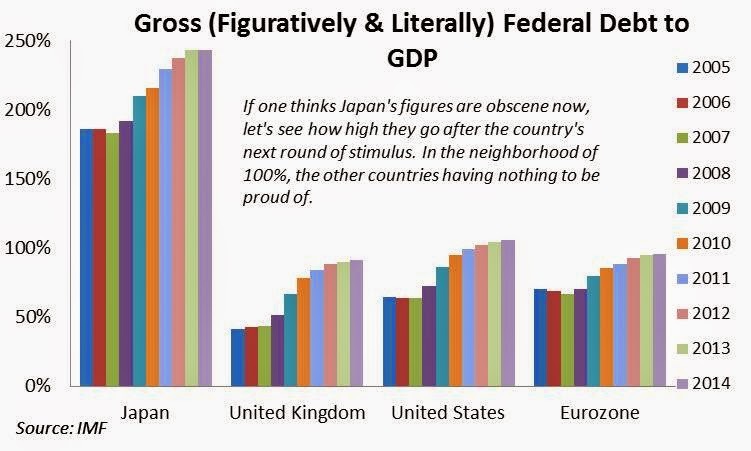 Expectations that the value of the dollar would rise relative to other currencies would only add to the attraction of investing in America. Not only does that translate into new factories, offices, and jobs, which then would spur consumption in a more sustainable manner, but the jockeying for U.S. assets would provide fundamental support to current corporate valuations, which by nearly all accounts, have gotten a bit ahead of themselves. Another related dose of common sense would be to reform the corporate tax code with the aim of reversing the current trend of tax inversion through foreign acquisitions. This exodus of U.S.-domiciled entities is precisely what the economy and government coffers do not need at this juncture. Weak-dollar apologists argue that a diminished currency aids the country by making exports more competitive and increases the value of foreign profits of American businesses, which account for close to half the earnings pie. But trade is a small slice of the U.S. economy and the country produces sophisticated capital goods that tend to be inelastic to currency fluctuations. In other words, if your military needs a U.S.-made fighter jet or your factory requires precision machinery, movement in the level of the dollar will not likely deter your purchase. And who doesn’t need a shiny new fighter jet? With regard to foreign profits, half of corporate revenue is still derived domestically and the increased purchasing power that accompanies a stronger dollar would stoke demand for foreign products, many of which are produced by U.S. multinationals. A weak dollar also has the…ahem…added benefit of monetizing the country’s debt, meaning a cheaper currency lessens the burden owed to foreign creditors. This is not the best way to win friends in the international community. Then again, it’s not much worse than tapping the private cell phones of the leaders of major allies. One can argue deep into the night whether or not the weakening dollar is an intended or unintended consequence of current monetary policy. If it proves to be an ephemeral distortion caused by recent extraordinary measures, perhaps the situation will right itself as the Fed attempts to successfully exit various initiatives, which is by no means guaranteed. More troubling is the prospect that the weaker dollar is a sign that investors are growing more concerned about U.S. growth prospects, its inability to control its fiscal position and the rapid encroachment of a regulation-happy administration into the private sector. Should these concerns materialize, U.S. investors and consumers will learn an unwelcome lesson on how a weak currency can diminish a country’s investment returns and shackle its growth prospects.